Since it has taken almost a year for me to share this, let's cut right to the chase. The general set up is really nice - it's a clean and spacious salon with lots of natural light (this matters to me). I took a trip to the salon/spa in December 2014 for a wash and blow dry. 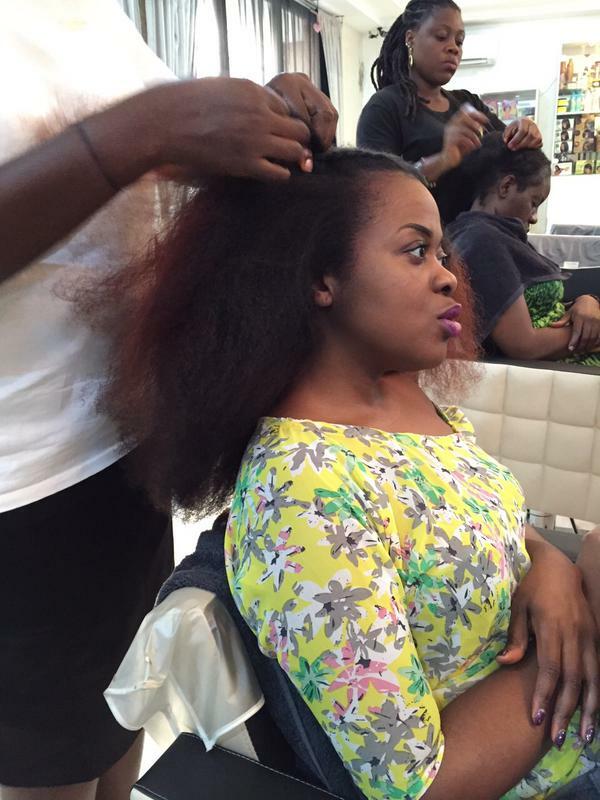 I was nervous as this is NOT a natural hair salon, and most salons in Lagos are high-risk for naturals. I wish I could remember the name of the lady who did my hair. She had butter fingers. I think I've mentioned before that I have a really sensitive scalp (tender-headed) so salon trips are a nightmare. In fact, I don't like people touching my hair full stop. She started off by parting my hair into 4 sections and worked through any obvious tangles or knots. Then she washed my hair (I took my own shampoo along) and de-tangled it section by section too. She used a large tooth-comb after letting the conditioner sit in my hair for about 10 minutes and it took about 15 minutes to detangle all of my hair. She was also very open to direction if I expressed a preference for doing things a certain way. She was really patient and polite and took her time with any stubborn knots. She also blew out my hair using the salon products I can't remember the specifics but there was definitely some kind of pomade involved. I brought my own hair dryer because 9 times out of 10 the salons in Lagos don't have the detachable hair dryer combs and, other than if you're using the 'tension' method, I really don't see how you want to blow dry thick natural hair without them. That process was a little more painful, but she was fast and once again, did it in sections. I kept it simple and asked for two french braids (protective styling is a must for me after a blow out). Pricing. The lady I spoke to on the phone said one price approx N3,000 I think), and then tried to charge me an additional N2,000 (£6.50/$10 but keep in mind that the cost of things is different) when it was time to pay. I refused. This is pretty common so always make sure you agree on a price beforehand and make sure the salon sticks to that price when you're done. Hope this was helpful for folks in Lagos!